Are you a fan of her earlier work? 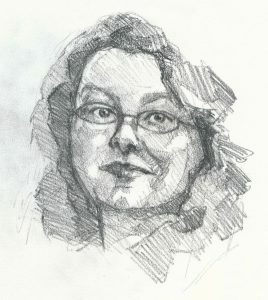 I feel like it might give you a better appreciation of what she’s up to here. (Here novel HEARTBURN is my favourite). 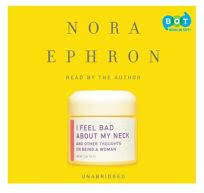 I read this book when it was published and thought of it again when a benign tumour appeared on my neck five years ago—and I was so relieved about its benignness that I decided I was never going to feel bad about my neck as long as it didn’t kill me (and I wonder if Ephron might have spent less time feeling bad about her neck had she known she’d die so young). I respect your opinion, Kerry, so I’ll add Heartburn to the queue. (But definitely not the audiobook version if she narrates it.) You raise an interesting point I didn’t address in my “review”: the discomfort that goes with reading Ephron’s extended complaints about this minor appearance-related stuff when (1) I’ve had enough harrowing experiences that have taught me not to worry about unimportant crap like grey hair and (2) knowing she didn’t have all that much longer to live when she wrote the book. But I guess messages like ‘Aging is perfectly normal and not a personal failing’ don’t amuse people in quite the same way.